Cover painting Untitled #12 (1960) by John Altoon. 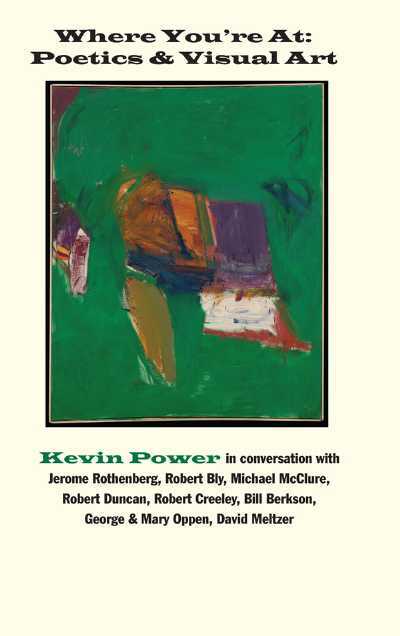 Between 1974 and 1976, Kevin Power, on a fellowship from the American Council on Learned Societies, interviewed eight modern American poets about the relationship between painting and poetics in postmodern American poetry. The interviews - with poet and art critic Bill Berkson, Robert Bly, Robert Creeley, Robert Duncan, Michael McClure, David Meltzer, George and Mary Oppen, and Jerome Rothenberg - were originally published in small literary journals in the mid-70s through 1980s. Those issues of Texas Quarterly, Vort, Spanner, Line, and Niagara, are now extremely difficult to come by. 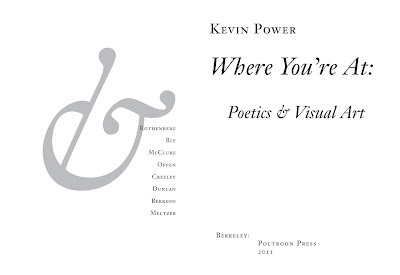 Poltroon Press of Berkeley, California, now celebrating its thirty-six birthday, has, fortunately, gathered the interviews together into a just-published collection, Where You're At: Poetics & Visual Art. The poets that Powers interviewed were directly involved with painters or American Art, or highly influenced by them, bringing the aesthetic of modern American art to their writing. "They were all part of a prolific range of American writing that was opening up new possibilities for poetry and poetics: literally exciting times," Powers declares. Here, Jerome Rothenberg discusses the deep image, "perception as an instrument of vision," an attempt "to bring the ojective and subjective world together and to try and eradicate the differences between them." Robert Bly makes a distinction between "the picture, on the one hand, in which there are simple objects from an outer world, and an image." The former is a fairly straight and objective visual metaphor or simile, the latter, a subjective visual with qualities of surrealism. Michael McClure talks about the nature of the exchanges between poet and painter in San Francisco during the '50s and 60s, the ideas that flowed back and forth, and the mutual influences. Creeley relates how, in college during the '40s, he was influenced by Paul Klee's Notebooks in which the painter talked of taking a visual line for a walk; the verbal analog is obvious. (Yet one could strongly argue that the visual/verbal line takes the artist/writer for a walk; the difference between leading and following, between control and abandon). "The whole imagination of art interested me." When he moved to France he became closely involved with art, particularly with painter René Laubies, introduced to him by Ezra Pound. David Meltzer recalls the role of artist Wallace Berman's L.A.-based Semina in providing a home for visual poetics; indeed Wallace Berman pops up more than once in the collection, which was thirty-five years in the making; estate clearances prevented Powers from publishing it sooner. The interview with Robert Duncan, at forty-five pages the longest, is worth the price of the book. Deeply immersed in the art scene of the 1940s and '50s, he was particularly attracted to Miro's busy canvases with lots of objects in them. "I liked the whole feeling of a mosaic going to pieces and that's what I wanted to happen in poetry." His goal was "writing that would be like painting." "The important thing to understand is that the picture we had of a possible painting or possible poetry is not the painting we saw but the painting we could imagine from what we saw." In short, the grammar of modern art - collage, surrealism, abstraction, chance, visual puns, assemblage, typographical design, etc., was co-opted by and informed modern poetry in an attempt to short-circuit objective language and subvert its superficialities toward deeper understanding and insight. It was also, at times, an exercise in throwing words up in the air and seeing where they landed, with the hope of unexpected revelation. The overarching aim seems to have been a desire to break-up objective reality and put it back together in such a way that the line between the objective and subjective became blurred if not erased. Objective reality was over-rated and not all it was cracked up to be; it was time to make that deeper reality manifest in the work: objective reality as a subjective construct. Along the way there's a lot of personal anecdote and revelation. Creeley talks about putting a drunk Willam de Kooning to bed, then checking out his studio; McClure mentions his encounter with still-inebriated De Kooning 3000 miles away when the artist makes clay animals with his daughter. The Oppens admit they don't approve of Ben Shahn because he began to imitate himself. They tell startling stories about the expatriate Jewish community in Mexico City. Berkson discusses the New York School in relation to painters like Philip Guston, Alex Katz and Larry Rivers, while Meltzer brings Berman, George Herms and Bruce Conner to the discussion. And Robert Duncan, a close friend of Anaïs Nin and an intimate member of her circle of artists and writer friends in Greenwich Village in the early 1940s, admits that he turned against her work, as well as Kenneth Patchen's. "I'd actually been lost in admiration for them as only an 18 year old could be...[But I later] realized that, as artists, they weren't responsible for their art, that their art was sort of a plaything for their personalities." To some readers the influence of modern art on postmodern American poetry will come as no surprise; you may have read these interviews (or any of Berkson's critical prose, i.e. Sudden Address: Selected Lectures 1981-2006) when originally published. The magazines they appeared in are no longer, and copies have become quite rare. To have these interviews brought together to read as a whole is a gift. I don't think it an exaggeration to assert that this fascinating collection of interviews is required reading for any student and/or fan of the arts and poetry. POWER, Kevin. 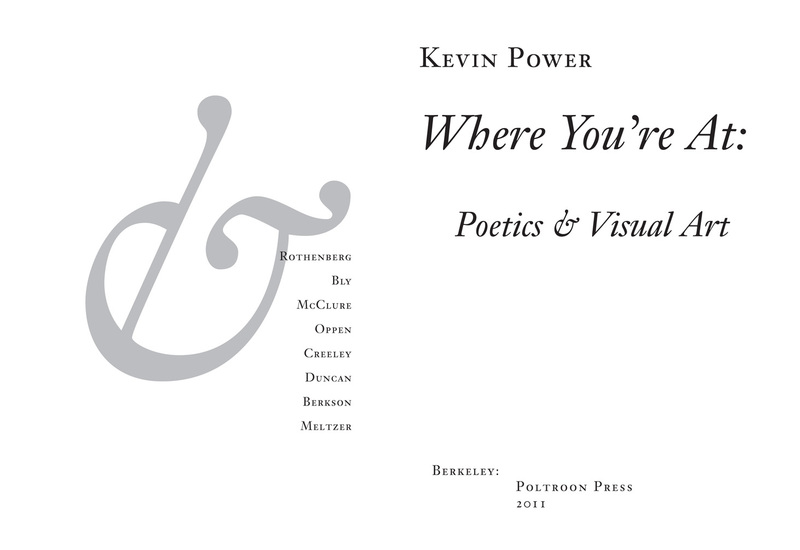 Where You're at: Poetics & Visual Art. Berkeley, CA: Poltroon Press, 2011. Octavo. 209, , pp. Pictorial wrappers. $19.95. To order contact the publisher. Images courtesy of Poltroon Press, with our thanks. Poltroon Press' "Alastair Johnston and Frances Butler, who provoke each other to ... pyrotechnic abandon, conceal a real sense of the outer edge potential of letterpress" (Nicolas Barker in The Book Collector, London, Summer 1990). I'll get the book! Interesting.